SINGAPORE (Nov 30): Back in 2002, as the city-state was emerging from its worst recession since 1964, the government was getting impatient over the economy's disproportionate reliance on multinationals and a handful of globally competitive state-backed firms like Singapore Airlines. A panel on "entrepreneurship and internationalisation" noted that only 5% of Singaporeans ran their own companies, versus 12% in the US. Then-finance minister and future Prime Minister Lee Hsien Loong vowed to end red tape and allow new structures like limited partnerships. Yet a decade and a half later, and after much tinkering with taxes and efforts to wean society off its obsession with good grades, decent (i.e. civil service) jobs, and affordable homes, nothing much has changed. The poster child of Singaporean entrepreneurship, Sim Wong Hoo's Creative Technology, is worth only US$63 million ($85 million), down from US$3 billion at the peak of dot-com mania. The local billionaires' club is all male, with an average age of 69 -- the same as in Japan. Moreover, it's an awfully boring group. There are five Chinese and three Hong Kong billionaires on the list of the world's top 200 art collectors, and none from Singapore, according to UBS Group AG and PricewaterhouseCoopers LLP. The only dash of colour comes from former stockbroker Peter Lim, the fishmonger's son who made his fortune from palm oil and a chain of Manchester United cafes in Asia. 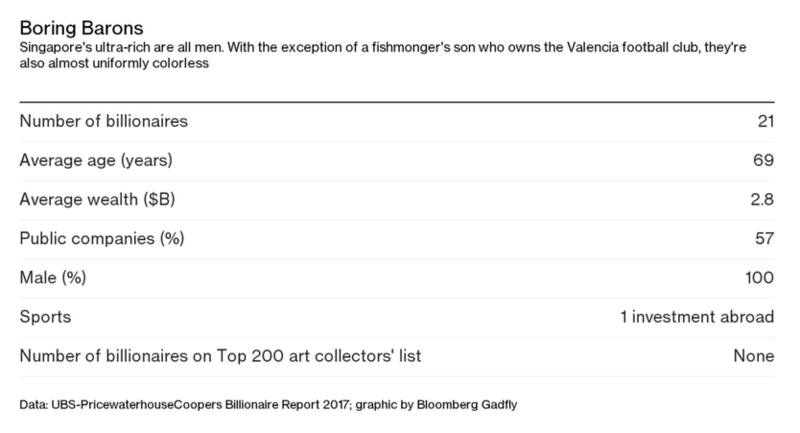 He owns Spanish soccer club Valencia, which makes him the lone Singaporean billionaire to own a sports team. So imagine the surprise when, out of nowhere, three megadeals fronted by Singaporean businesses hit the headlines. • Japan's Nippon Paint Holdings Co., whose biggest shareholder is 90-year-old Goh Cheng Liang, is bidding more than US$8 billion for Axalta Coating Systems. • Kuok Meng Ru, a 29-year-old scion of Malaysian tycoon Robert Kuok's clan, is seeking to buy out Rolling Stone, the US pop-culture magazine in which his BandLab Technologies took a 49% stake last year. To be sure, Broadcom won't be in Singapore for long. Tan, a Malaysian-born alumnus of Massachusetts Institute of Technology and Harvard University, turned Avago Technologies into a world-class chipmaker with his 2015 purchase of Broadcom Corp. He housed the new company -- Broadcom -- in Singapore. Earlier this month, though, Tan said he was taking the firm back to the US. Others are staying put. Grab, the ride-sharing app that's giving Uber a run for its money in Southeast Asia, may have been born in Malaysia, but co-founders Anthony Tan and Tan Hooi Ling chose Singapore to drive their regional expansion. Grab is one of Singapore's two unicorns. The other is Sea. The gaming and e-commerce company had a rocky debut in New York last month and had fallen 24% below its IPO price as of Wednesday after posting a quarterly loss that more than doubled from a year earlier. Whether founder and CEO Forrest Li can get past the growth pangs remains an open question. But even if Sea's sizzle has turned to fizzle, the US$7.2 billion of equity raised by Singapore tech startups over the past six years is starting to cause a buzz. It's too early to say if Singapore is on the cusp of a golden age of entrepreneurship. What's more clear though is the government's resolve to allow more competition, even when state-linked firms like Singapore Telecommunications, StarHub and ComfortDelgro Corp. bear the brunt of disruption in telecom, media and transport. Startups are betting the city's banking industry will be next up for creative destruction and the government won't go out of its way to protect its interest in DBS Group Holdings, the biggest of the three local lenders. 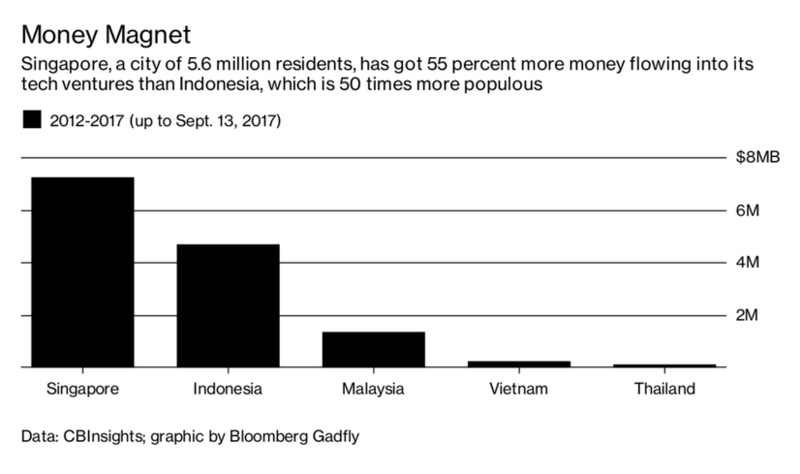 The arrival on the scene of a Singaporean Li Ka-shing -- or a Jack Ma -- is still some ways off, but at least the city's businessmen are finally losing their straitjackets. -- with assistance from Nisha Gopalan. This column does not necessarily reflect the opinion of Bloomberg LP and its owners.